The John of Gaunt window was a part of Agecroft Hall, a 15th century Tudor-style mansion originally located on the banks of Lancashire’s Irwell River in England. This beautiful window first adorned the private chapel of the mansion. Later, the home was remodeled and the chapel space became the dining room. Today, one can visit this grand window in Richmond, Virginia, in the United States of America. How did an authentic Tudor mansion end up in Richmond? In 1925, a wealthy man named Thomas C. Williams purchased the dilapidated Agecroft Hall. The house was dismantled and shipped to Richmond, Virginia where it was reassembled overlooking the James River. According to the wall placard, the John of Gaunt Window was not part of this original shipment of 1925. 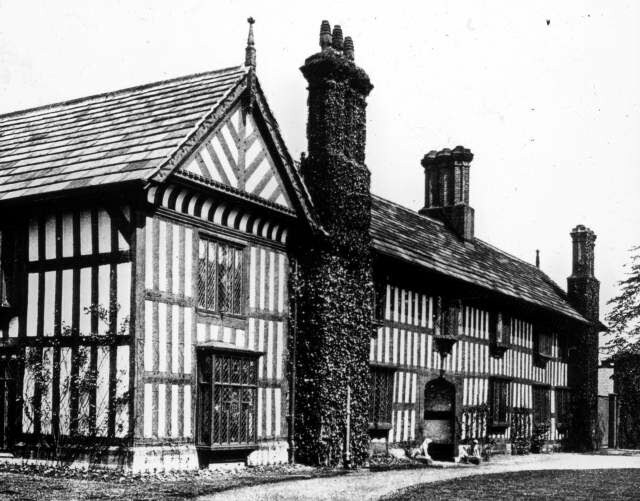 According to Agecroft Hall staffers, it was kept in the family and instead moved to Lovell’s Court in Dorset, England, approximately 200 miles south of its original home. The window was finally reunited with Agecroft Hall in the summer of 1979. Unfortunately, many of the glass panels broke and extensive restoration needed. The repairs were completed in 2009 and it is currently showcased as one of the Hall’s permanent exhibits. It is not known when the window panels and the hefty carved oak frame they sit in were originally made however; it couldn’t have been before the reign of Henry VII, unless the panels were installed at separate times. It is also not known who the artisan or artisans that made the John of Gaunt might have been, but later in the third section I will tell you a little information about the typical glass painters of the time. While the design is simple, not nearly as ornate as many stained glass windows created during the same time period, the most fascinating aspect of the window panels are the stories and politics one finds associated with the images. Much of the secular population was illiterate and it became popular to use coats of arms and banners to signify ones familial and political associations. Let’s take a closer look at the individual panels and see how they relate to people and politics. Please continue to my website for a more in-depth look at the John of Gaunt window, including a panel by panel explication of the elements of the window, an obscure legend surrounding its history, and a look at the glass artisans of the time period. A bibliography of resources consulted in my research of the window is also included.